The 4iiii Precision power meter is a relative new crank based power meter from Canadian company 4iiii Innovations. The 4iiii Precision power meter comes in different crank lengths for all major Shimano groupsets from 105 (5800), Shimano Ultegra (6800) up to Shimano Dura Ace (9000). The 4iiii Precision power meter comes with the free 4iiii Device Configuration app for Android and iOS. The Dura Ace 9000 version can be upgraded to a dual Precision Pro power meter system and is used as such by professional World Tour cycling teams Ettixx Quick Step and Bora Hansgrohe. I wrote a more extensive review (in Dutch) on the Ultrabikes website as a guest editor: “4iiii Precision Single Powermeter Review“. Check it out ! The 4iii Precision power meter is a strain-gauge based power meter of just 9 grams (on top of the normal weight of a crank arm). The dimensions of the 4iii Precision are 8 x 38 x 29 mm., making this one of the smallest measurement boxes on a crank-arm. Pioneer and Stages have a similar approach, but the measurement unit including battery is bigger with other brands. Another well thought out part is the battery door that can be opened and closed without any extra tools. It is a simple but effective twist and turn lock-system that works well and keeps the internals free of water. If you can exchange a crankarm and pedal, than you can also install the 4iiii Precision power meter. On the Shimano Tech Docs section you can find a good Shimano Instruction manual (see page 17) with clear instructions on how to remove and install your Shimano Hollowtech II cranks. In more detail you need to follow 1+5 steps to hit the road with your 4iiii Precision power meter. 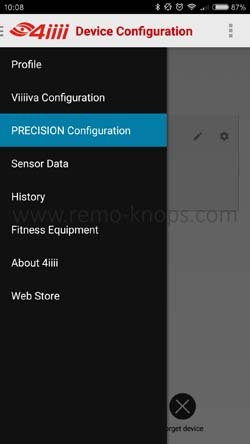 With the 4iiii Device Configuration App you can connect to the 4iii Precision power meter or the 4iii Viiiiva and configure the devices to your needs. When you connect the 4iiii Device Configuration App with the 4iii Precision power meter it automatically checks the firmware version and triggers a firmware update when needed. 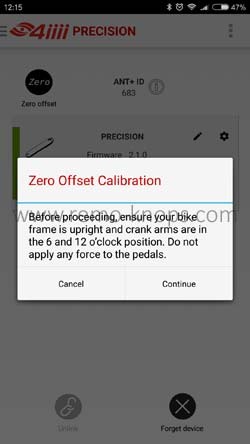 Some of the mentioned items can also be done with help of a cycling computer, for example the zero calibration is triggered each time my Garmin Edge computer connects to the 4iiii Precision power meter. 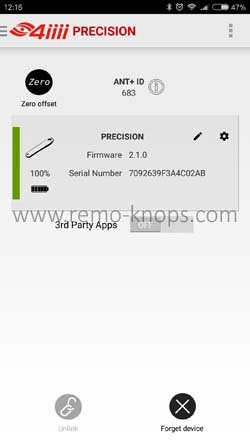 However the 4iiii Device Configuration App is of a good quality and is highly functional. Good to have a good App in addition to a well designed power meter. During the testing period, thanks Ultrabikes for that opportunity, I’ve enjoyed the 4iiii Precision power meter on the road. Both on my Tacx indoor-trainer as well as outdoor during rides with Tourclub Kerkrade I haven’t experienced any issues or dropouts with the 4iiii Precision power meter. The measurement is consistent and proven to be reliable, very close to the configured power output on my indoor trainer. The Pioneer Pedaling Monitor System / Pioneer Single Powermeter shows lower values given a certain configured power output. 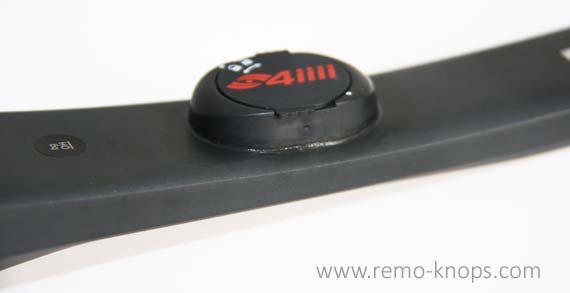 The 4iiii Precision power meter is about 4 or 5 watt from the configured power on the Tacx indoor-trainer. After cleaning my road bike with the garden hose a couple of times, I opened the battery door to check if there were any issues with the seal. Again the 4iiii Precision power meter proved its quality, while I’m currently still using it for a more long-term review, where I try to get some rides in extreme (hot or rainy weather). I needed just to get used to the zero calibration ritual before each ride, however it’s something to that quickly becomes an automated habit when you get your bike for a spin. The 4iiii Precision power meter is available in different versions (in line with the Shimano groupset differentiation) and various crank lengths. Dura Ace 9000 riders could potentially upgrade to a dual or bi-lateral power meter system at a later point in time. The professional World Tour cycling teams Ettixx Quick Step and Bora Hansgrohe are riding this set-up. 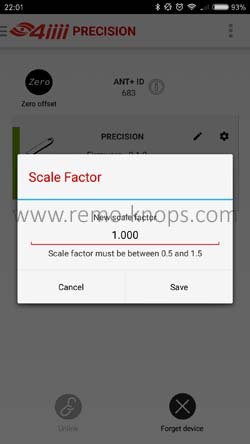 Another unique is the scale factor option, which allows you to configure the left/right balance from within the 4iiii Precision smartphone app. I can set this balance also on my Pioneer SGX-CA500 cycling computer, but haven’t seen this feature with major other players in the power meter space. Overall the 4iiii Precision power meter is a solid quality product (so far) with a good feature set and at a competitive pricing strategy. Only feedback I could think off is the limited availability of the Dura Ace 9000 dual power meter option in the Netherlands (or the involved costs when sending your crank set to Canada). What frame did you have this attached to? I’m looking at getting a 4iiii power meter for my Canyon Ultimate and just concerned about frame clearance. I’ve tested the 4iiii Precision Powermeter on my Canyon ultimate CF SLX (2014/2015 model). In practice the sensor is situated on 8,5cm – 12,5 cm from the tip of your crank. This is where you should be able to put a 10 mm allen key between the horizontal chain-stay and your crankarm. See here for a picture of the measurements. Hope this helps … let me know if you have any more questions. Hey!, I found this information for you: "4iiii Precision Power Meter Review". 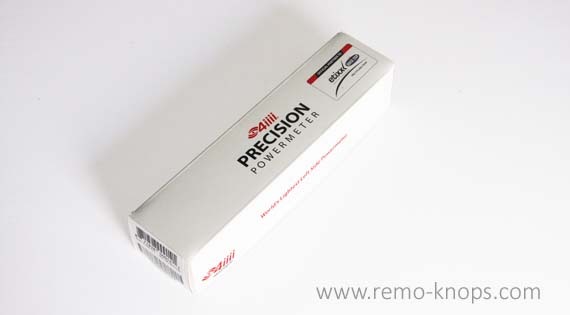 Here is the website link: https://www.remo-knops.com/6270/4iiii-precision-power-meter-review/. Thank you.